If you aren’t into the history of the Castlevania series, you won’t recognize the importance of this, but longtime series fans will. In 1993, Konami released Dracula X: Rondo of Blood in Japan for the PC-Engine console (known as TurboGraphx and later TurboDuo in America). Because the console sold so poorly in the US, the game never made it here legally (it’s a hot post in the TurboDuo usenet group and has been a highly sought after disc on Ebay). 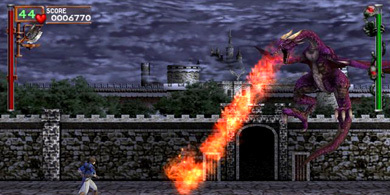 Now, nearly 15 years later, Castlevania: Dracula X will be available on the Sony PSP in the dual-game release Caslevania: Dracula X Chronicles (obligatory shorter link), which will include both Dracula X: Rondo of Blood and the associated title Symphony of the Night, originally available on the PlayStation 1. For a bit more information on this, check out the video interview at TechEBlog (and the shorter link) that covers some of the changes and additions from the classic to the port.